Welcome to a new year of #whimsicalwednesdays! Let's kick off the year with open stitches, sparkly threads, and beads, shall we? Let's start with the first stitch. The stitch is connected octagons with all sides over two rows. While I am aware the primary shape is the octagon, I see the diamonds first, hence the name. This version would be great for nature, especially areas that don't need a heavy stitch. Think water, sky, clouds. It's a wonderful way to show off the canvas painting. The stitched sample uses Sparkle! Braid for a sky on 18-mesh. Make it the "Or Not" version by adding an Upright Tied Cross in the center and a bead inside the diamond. It's really something, especially when you mix threads and add beads. A stitcher friend shared a wonderful sample with me. Click on image to see on whimsicalstitch.com on Pinterest. Visit pinterest.com/whimsicalstitch/whimsicalwednesday for a library of all #whimsicalwednesday and #smallspacesunday stitch diagrams. Click on image to see on whimsicalstitch.com's Instagram account. 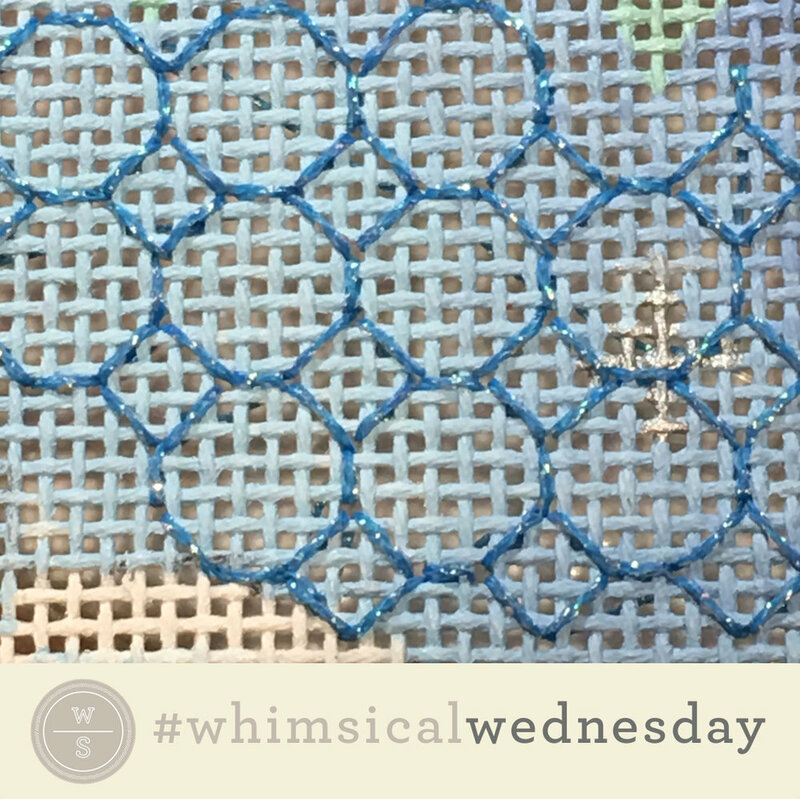 Visit instagram.com/whimsicalstitch for a library of stitched samples for select #whimsicalwednesday and #smallspacesunday stitch diagrams. The first stitched sample uses Kreinik Metallics Medium Braid for the diamonds, Rachel for the Upright Tied Cross, and a Sundance Bead. It's exquisite and inspiring. She is using it for a large flower petal. It would be great for clothing, especially dresses or dramatic coats. Replace the bead with an Upright Cross and change the focus to matte threads, such as Pepper Pot, Gloriana Silk Floss, or even Straw Silk, and you would have fantastic greenery. The second stitched sample is an illustration of thread weights. The sample includes Soie D'Alger and a Sundance Bead. The octagons are two plies of Soie D'Alger and the Upright Tied Cross is a single strand of the same Soie D'Alger. I love the lightness of it. And the shading shines through beautifully. These stitch diagrams, along with all other #whimsicalwednesday and #smallspacesunday stitch diagrams, can also be found on a Pinterest board here. If you like what you see on this blog, want to learn some very creative decorative stitches, and how to put them all together, whimsicalstitch.com sells stitch guides and stitch concepts for Melissa Shirley Designs, Zecca Designs, and Patience Brewster. 48 guides are currently available and more are in the works. I will be posting about 15 new Stitch Concepts later this month, so stay tuned! I hope you have the perfect spot for this stitch! Enjoy! And happy, happy 2018!